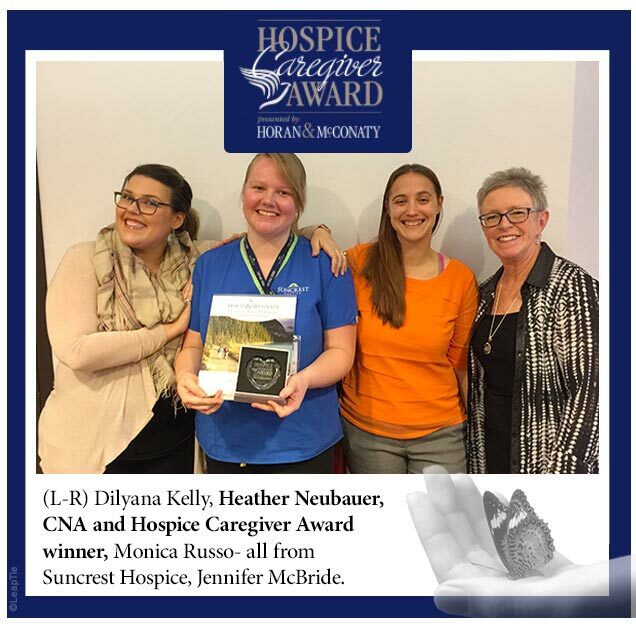 Heather Neubauer is the winner of the Hospice Caregiver Award presented by Horan & McConaty. She was nominated by Meg Paraspolo. I would like to nominate one of our CNAs for the Caregiver of the Month Award. Heather Neubauer provides amazing and compassionate care for all of her patients, but I am nominating her for this award after hearing about how she went above and beyond with a recent patient. Months ago, I had the pleasure of meeting one of our patients upon admission, a woman in her late 50’s who was battling breast cancer and coming to the end of her journey. When August 21, 2017 arrived, Heather was there with our patient getting her tired body ready for a special trip. Heather went above and beyond that day, helping a bedbound woman with a love of astronomy to get into a wheelchair and safely up to the roof to experience and enjoy the total solar eclipse that occurred that day. I heard this story told by the nurse on this case, and it immediately brought tears to my eyes. Heather gave such an incredibly special gift to this woman, and I am so thankful to know that Heather is a part of the hospice team.